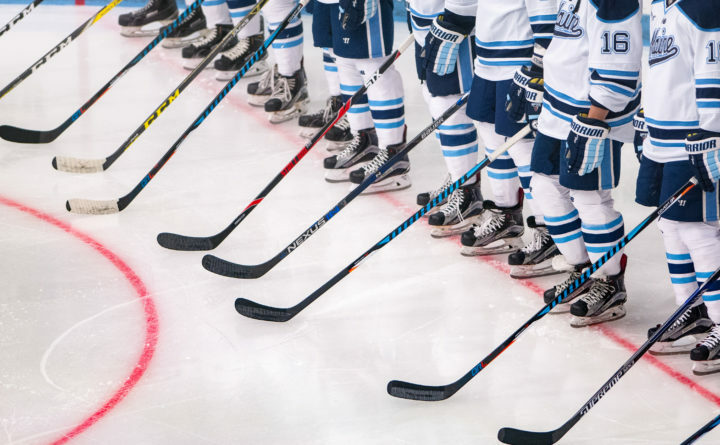 The University of Maine men’s hockey team’s has now failed to reach the Hockey East semifinals for the seventh consecutive season. Sophomore goalie Cayden Primeau made 33 saves and senior right wing Brandon Hawkins’ five-on-three goal 10 seconds into the second period proved to be the game-winner as the third-seeded Northeastern University Huskies completed a best-of-three quarterfinal sweep of the Black Bears with another 2-1 win. Northeastern won Friday night’s game by the same score in overtime. UMaine sophomore Jeremy Swayman wound up making 15 saves. Northeastern improved to 25-10-1 with its fourth straight win and ninth in it last 10 games. Northeastern advances to next Saturday’s Hockey East semifinals at the TD Garden in Boston. UMaine wound up 15-17-4 and has now lost nine consecutive Hockey East playoff road games and 17 of its last 18 dating back to the 2008-09 season. It was the 20th time UMaine has been held to two goals or less this season and eighth time the Black Bears have scored one or fewer goals, including three times in the last four games. Junior center Biagio Lerario staked the Huskies to a 1-0 lead with 1:51 left in the first period as he scored from the slot off a pass from Patrick Schule. It was his fourth goal of the season. Later in the period, cross-checking penalties 52 seconds apart on Eduards Tralmaks and Brady Keeper enabled the Huskies to have a 5-on-3 for 1:08 spanning the final eight seconds of the first period and a minute into the second period. Keeper also picked up a 10-minute misconduct. Hawkins converted with a drive from the right point. Jeremy Davies and former UMaine player Liam Pecararo picked up assists. It was Hawkins’ 10th goal. Thirty-six seconds later, UMaine’s Emil Westerlund was assessed a five-minute major and game misconduct for contact to the head, but UMaine was able to kill that off. Lerario’s hooking penalty and John Picking’s slashing call gave the Black Bears a two-man advantage and Jacob Schmidt-Svejstrup scored his sixth with a one-timer from the faceoff dot off a Sam Becker feed. Jakub Sirota also earned an assist on UMaine’s first power play goal in eight games. The Black Bears had three power plays in the third period but failed to convert. Keeper hit the goalpost and the crossbar in the third period and Simon Butala rang a shot off the crossbar. UMaine’s Mitch Fossier had a goal disallowed in the third period when he batted the puck toward the net with his glove and, before he could get his stick on it, it hit an Northeastern player’s skate and went in. UMaine outshot Northeastern 42-32 on Friday night. Primeau, a seventh round draft choice of Montreal and son of former NHLer Keith Primeau, is now 6-0 against UMaine in his career with a 1.67 goals-against average and a 0.945 save percentage. He led the United States to a silver medal in the World Junior Championships in Canada in December and January. It was the last game for UMaine senior left wingers Brendan Robbins and Danny Perez; defensemen Becker, Keith Muehlbauer and Rob Michel, center Canon Pieper and goalie Rob McGovern.